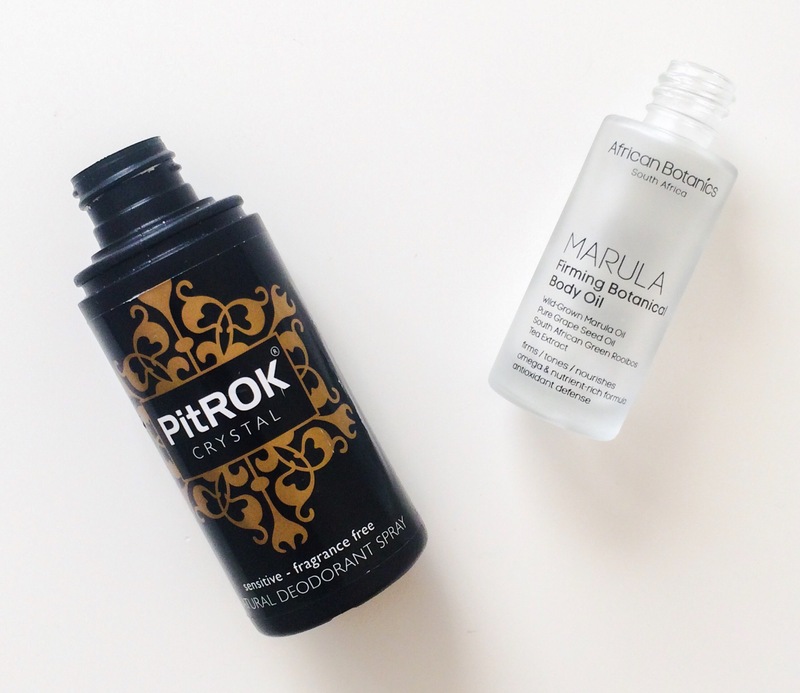 It’s a little hard to keep track of empties on the road because on one hand it’s a bit weird travelling around with empty products but on the other hand, I want to keep them so I can blog about them! I kept as much as I could but a lot of things I have used up have been dumped a long the way (stuff I have mentioned before many times) so these are the things I have finished recently AND been able to hang on to. Aloe barbadensis leaf juice*, Salix alba (Willow) bark extract*, Sclerotium gum, Lactobacillus Ferment, Lactobacillus/Punica granatum fruit ferment extract, Leuconostoc ferment filtrate (radish root extract), , Maltooligosyl Glucoside, Hydrolyzed Corn Starch, Beta vulgaris (Beet) Root Extract, Hydrogenated Starch Hydrolysate, Kaolin (Rose Clay), Sodium phytate, Aroma**, Citral, Citronellol, Limonene, Linalool, Benzyl Alcohol, Geraniol. *Ingredients from organic farming ** Clinical grade essential oils blend. Easily one of the best masks out there and absolutely one of my all time favourite beauty products. If you haven’t tried anything from Tata Harper, I definitely recommend buying this first because I don’t know anyone who doesn’t love it. This is an exfoliating treatment that uses pomegranate extract as well as aloe vera, white willow (natural salicylic acid) and French pink clay to exfoliate, purify and decongest for skin that is glowing, clear and baby smooth. I sometimes wear this mask overnight to reap maximum benefits and I love how my skin looks in the morning. 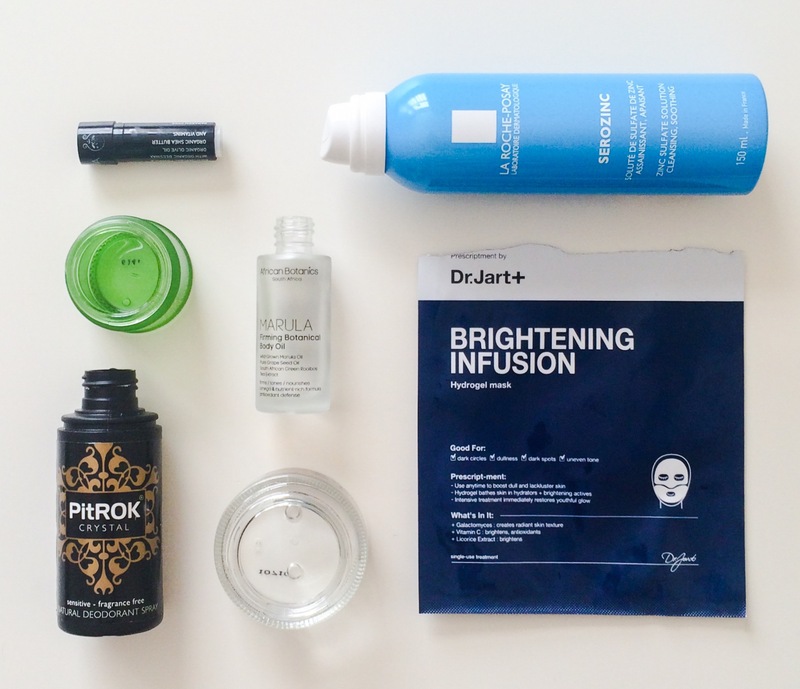 You can also use it on individual blemishes as a treatment and that works even better when you mix the mask with the excellent purifying cleanser. 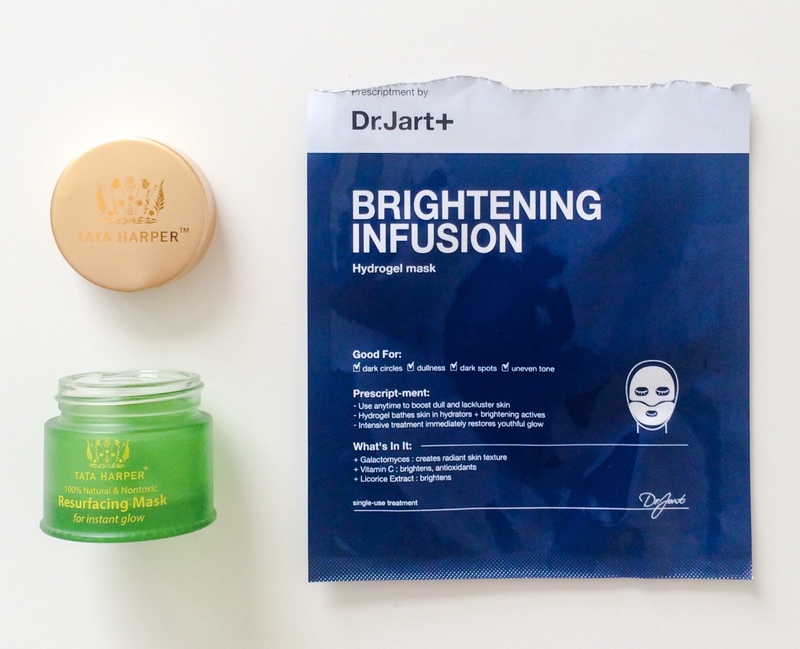 After having great success with Dr. Jart+’s other sheet mask, I was so excited to try this but it was a huge disappointment. I was hoping that because the mask was in two parts it would fit better but it didn’t and because the mask is so thick, I had a hard time keeping it on my face unless I was lying down (which I couldn’t do). Not only that, there wasn’t much essence and it dried out within about 15 minutes! After I removed it there was an unpleasant sticky residue on my face that when I tried to massage in, it balled up and fell off. Not good! This sheet mask was a complete fail and I definitely regret buying it, the other ones from the brand are MUCH better. I feel like this product needs no introduction or explanation but incase you somehow missed the boat on this one or still don’t quite understand what it’s all about, I’ll tell you. This is a zinc sulphate spray that you use as a gentle astringent toner to regulate sebum production, fight bacterial and heal blemishes. When I first got this I thought there was no way with just three simple ingredients (thermal water, salt and zinc sulphate) it could do anything beneficial for my skin but IT DOES. It really speeds up the healing of any blemishes and I definitely notice that my skin is less oily when I use it. I know it’s not available in the U.S. but if you happen to find yourself in England or France (or know anyone going) get some! It’s really inexpensive and absolutely worth a try. I long for the day I can walk into Target or CVS and see it sitting on the shelves there. It happened with Glow Tonic (thanks to the Caroline Hirons effect), so why not this?! 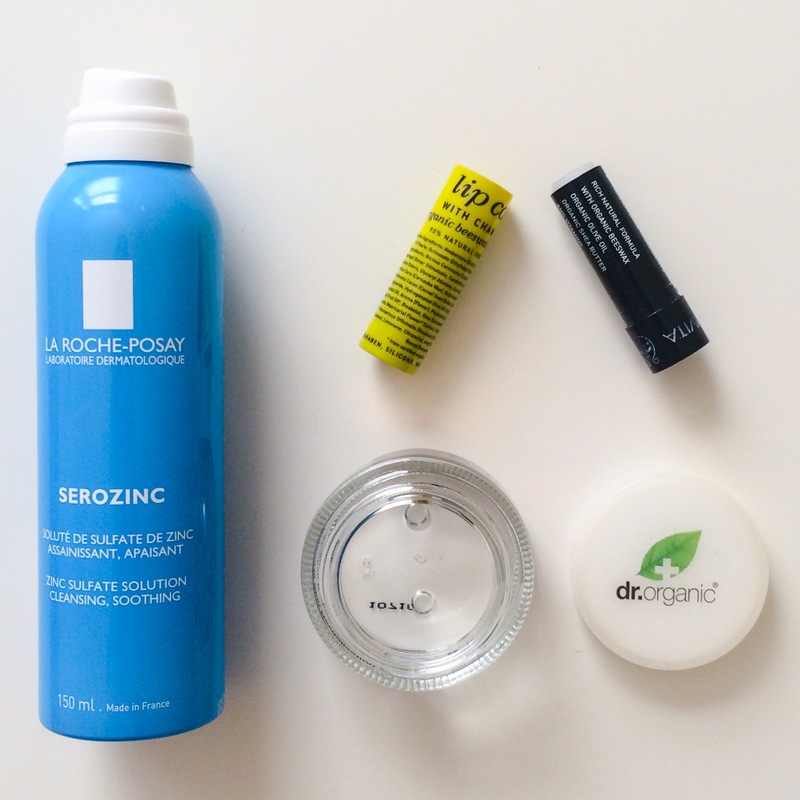 Oh, and I would love for La Roche Posay to release a travel friendly size of Serozinc like Pixi did with Glow Tonic – it’s just what my mini skincare collection is missing! Aloe barbadensis leaf juice, Aqua, Snail secretion filtrate (Helix aspersia muller), Glycerin, Polyglyceryl-3 cocoate, Sodium hyaluronate, Phenoxyethanol, Potassium sorbate, Ethylhexylglycerin, Disodium EDTA, Sodium hydroxide, Litsea cubeba oil, Cymbopogon schoenanthus oil, Citrus aurantifolia oil, Citral, Citronellol, Limonene, Geraniol, Linalool. I have been using this product on and off since its debut and while I really like using it, I’m still not too sure about it. I tend to use it as a moisturizer in the summer and as a serum in the winter or as a spot treatment to help heal blemishes quickly. It is so versatile and will do everything from heal, soothe, purify, smooth and brighten BUT there are some issues. Despite the name of the brand, I don’t think there is a single organic ingredient in this gel and there is no information about how much snail filtrate is actually in it, which is disappointing. Not only that, the high water content means it’s not as hydrating as it could be and I find the glass jar packaging highly unhygienic. Also, this brand is not currently available in the U.S. so it is not easy to get hold of at all. Repurchase? I don’t know! I think I am going to try the CosRX 96% Snail Mucin Essence next. Avobenzone (Butyl Methoxydibenzoylmethane) 1.5%w/w, Octinoxate (Ethylexyl Methoxycinnamate) 7%w/w, Ricinus Communis (Castor) Seed Oil*, Oleyl Alcohol, Diisopropyl Dimer Dilinoleate, Candelilla Cera (Euphorbia Cerifera Wax), Copernicia Cerifera Cera (Carnauba Wax), Glyceryl Abietate, Cetyl Esters, Butyrospermum Parkii (Shea) Butter*, Theobroma Cacao (Cocoa) Seed Butter, Jojoba Esters, Olea Europaea (Olive) Fruit Oil*, Cera Alba* (Beeswax*), Aroma (Flavor), Carthamus Tinctorius (Safflower) Seed Oil, Hydrogenated Olive Oil Cetyl Esters, Punica Granatum Seed Oil*, Persea Gratissima (Avocado) Oil, Prunus Amygdalus Dulcis (Sweet Almond) Oil, Phytosterols, Rosmarinus Officinalis (Rosemary) Extract, Olea Europaea (Olive) Fruit Oil, Ammonium Glycyrrhizate, Ascorbyl Palmitate, Linoleic Acid, Tocopheryl Acetate, Pelargonium Graveolens Flower Oil*, Sorbic Acid, Benzyl Alcohol. My sister randomly bought this for me from Hong Kong and I really liked it. It was nicely hydrating, didn’t feel sticky or greasy and I found the camomile scent very pleasant. The only thing I didn’t really like was the chemical sunscreen they used for the SPF as I tend to stick to physical but other than that, it was nice enough. Apivita is a pretty famous European (Greek) brand but they’re not widely available in the U.S. Dermstore has a good selection though, so you can check them out over there. Repurchase? No, only because of the SPF but I would try one of their other lip products. If you love body oils, this is up there with the best. It only has four ingredients, is light and silky in texture and smells incredible. I love using this after a hot bath or shower because it really nourishes the skin without being heavy and the scent is so beautiful, it just perfectly sets the mood for a great night’s sleep. After I used this my skin is hydrated, smooth, soft and plump. I alternate between this and the Marula Stretchmark Botanical Body Oil which smells even more amazing and has been a long time favorite of mine. I keep this travel size bottle so I can refill it for every trip because flying is dehydrating on skin all over the body and this is an excellent fix for that. I bought this in London on the recommendation of Ruth Crilly over at A Model Recommends and used it all summer and really liked it. The spray was a convenient and easy to use alternative to my Lavilin cream and it definitely worked. The only thing I didn’t really like about it was if you sprayed too much it took a long time to sink in but other than that it was a great product. I don’t think this is available in the U.S. (like most of the products in this post *rolls eyes*) but I would definitely consider getting again because it’s a great price and lasted a really long time. Woo! So happy to have this done and be able to finally get rid of these empties! I’ve nominated you for the Lovely Blog Award. For more information check out my blog. Interesting as always to read your reviews! 🙂 if you looking for a more natural cream or serum with the snail extract, Bioearth has a couple of different options. The line is called Loom and you can find it on Ecco-Verde. I got a sample to try from a friend. I was the cream for dry skin. hard to see any different in a couple of days but it felt very gentle on the skin. Thank you! I haven’t been using it much lately as I am travelling and running low but when I do use it, I love it!